Statement shoes are one of the most popular fashion trends right now. You’ll see them on runways and sidewalks all over the world. But while many women are passing on the over-the-top styles and sky-high heels, there’s another statement shoe trend women of all ages are embracing: bright color. Start with a simple style in the heel height that suits you best. But do it in a color that’s completely unexpected and different from your outfit. 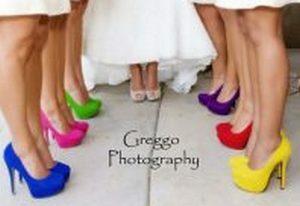 I love all the red shoes in the first three pictures, and love LOVE the colorful bridesmaids’ shoes. 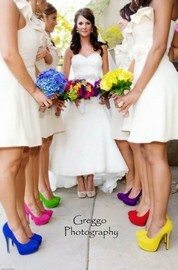 Notice how each bridesmaid’s bouquet matches her shoes, while the bride’s bouquet is a mixture of everyone’s colors. Such a simple and symbolic – yet elegant – idea. But what about Bethenny Frankel’s shoes? The orange pants and green shoes work, but it’s not a combination that readily comes to mind. How can you be sure such different colors work together? The three primary colors are red, blue, and yellow. Colors in the same color family are monochromatic. Colors opposite each other are complimentary. Colors next to each other are analogous. 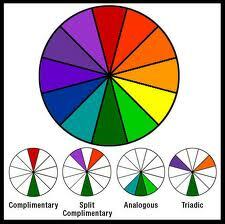 Colors next to complimentary colors are called split-complimentary. 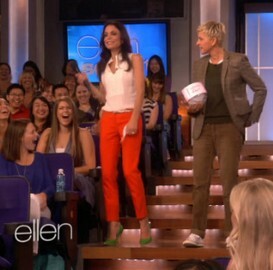 So in Bethenny’s case, her pants and shoe combination are split-complimentary colors, because the compliment of orange is turquoise, and turquoise is analogous to green. Again, it’s not a combination that readily springs to mind, but I wanted to show it to get you thinking. If you’re short on funds or looking for new ways to wear old things, pull out a color wheel and start experimenting. 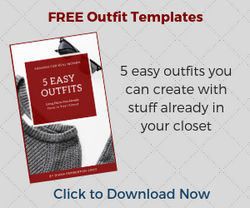 You may be surprised by how many new, interesting combinations are hanging in your closet. So what color handbag should you wear? It depends. Match the handbag to the shoes if you want to tie them together, or to your clothes if you want to draw attention to your shoes. Figure out where you want to put the focus, and choose the colors accordingly. So…a fun, easy way to partake of the current shoe trend. Do this with flats, booties, heels, platforms – whatever suits your style. You’re sure to draw attention and PLENTY of compliments. Try it for yourself and see. Need a little more help putting colors together? 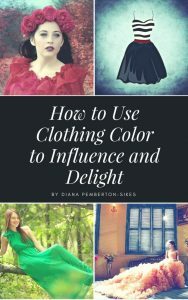 Download a copy of “How to Use Clothing Color to Influence and Delight” right now. Diana Pemberton-Sikes is an image coach who helps women upgrade their lives by upgrading their image. Ready to get the attention, respect, and income you deserve? Create Your Ideal Image can help.